Der CSIM11-ORP misst das Redox-Potential (ORP) einer Lösung. Er kann im Wasser versenkt werden und in Tanks, Rohren und offenen Kanälen eingesetzt werden. Er wurde nicht für Anwendungen unter Druck entworfen und kann nicht mehr als 30 psi ausgesetzt werden. Sollten Sie einen Sensor für einen Einsatz unter höherem Druck benötigen, fragen Sie bitte an. Der Sensor wird mit 10m Standardkabel geliefert, andere Kabellängen auf Anfrage. The CSIM11-ORP is similar to the CSIM11, but includes a 0.2-in. platinum band wrapped around the glass electrode, which allows the CSIM11-ORP to respond to the electron density in the fluid. 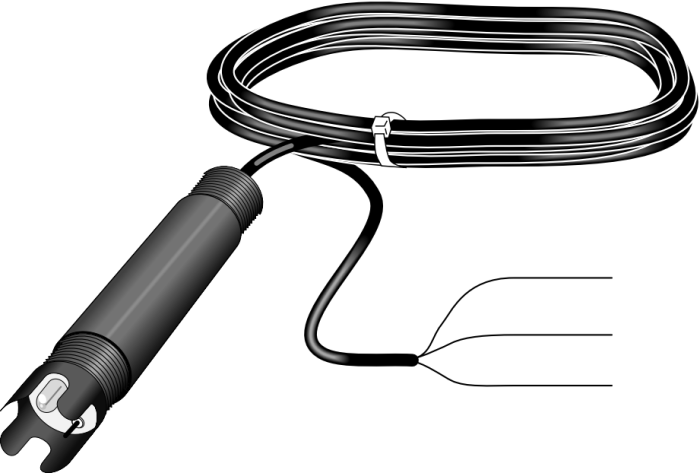 It has a plunger-style pH glass electrode that allows the CSIM11-ORP to be mounted at any angle. The probe's porous polytetrafluoroethylene (PTFE) liquid junction is less susceptible to clogging as compared to conventional reference junctions. A titanium ground rod runs inside the PPS outer body to eliminate ground loop errors. An internal amplifier boosts the signal, decreasing signal interference. The amplifier is powered by two internal lithium batteries, and thus does not require any current from the datalogger. These batteries are designed to last the lifetime of the probe. The reference solutions and bulb configuration are optimized for natural water applications. Alternate reference solutions and bulb configurations are available. Contact Campbell Scientific for pricing and availability. Note: The CSIM11-ORP uses glass bulb technology which has a life expectancy of around 6 months to 2 years, depending on the conditions of the water. The CSIM11-ORP requires one differential analog input channel.